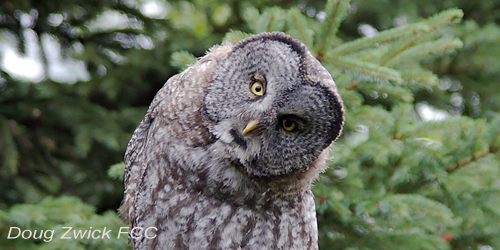 Shows » Why Do Owls Bob Their Heads? To determine what’s what and what’s where . . . If you were to stand face to face with an owl, it would eventually move its head, bobbing rhythmically from side to side, then forward, then back. Or almost completely upside down. This head-bobbing action helps make up for an anatomical limitation: an owl’s eyes are fixed in position — they can’t move the way a human’s eyes do. The owl’s varied head movements help it judge the position and distance of things around it — essentially, to triangulate on objects, including potential prey. And to build a composite picture of its surroundings. If you were to stand face to face with an owl, after a while it would start to move its head, bobbing rhythmically from side to side, then forward, then back. Or almost completely upside down. All while still looking at you, with its body still facing the front. Is the owl trying to communicate something? Is this, perhaps, some kind of dance? All these varied head movements help the owl judge the position and distance of things around it — essentially, to triangulate on objects, including potential prey. And to build a composite picture of its surroundings. This head-bobbing helps make up for an anatomical limitation: an owl’s eyes are fixed in position — they simply can’t move the way our eyes do. So to look up, down, or to the side, an owl has to move its head. They have very flexible necks and can do ¾ of a full head turn, looking over one shoulder, around the back, and almost over the opposite shoulder. And after a few of these head-bobs to triangulate on their prey, they rarely miss. Bird sounds provided by The Macaulay Library of Natural Sounds at the Cornell Lab of Ornithology, Ithaca, New York. Great Gray Owl  recorded by Sture Palmer;  recorded by L J Peyton; ambient sound from Great Gray Owl  recorded by D S Herr.